Much as this one will be, the prior Industrial Revolution was a tumultuous time for American workers. Along with the rise of non-farm industries and factories came a precipitous decline in farm labor. In 1800, nearly 75 percent of America’s labor force worked on farms. The remainder — America’s artisan middle class — were blacksmiths, innkeepers, and carpenters. Both groups were largely self-employed. But by 1915, most Americans had sought employment as we know it now: About 70 percent of America’s workers were engaged in non-farm occupations, and about a third of those were manufacturing roles (compared to less than a tenth today). Those figures, believe it or not, understate the economic implications of such a shift. In mere generations, the American labor landscape went from a loose network of individual contributors to highly organized clumps of workers working toward goals beyond the immediate needs of their communities. In other words, the Industrial Revolution was a seismic shift from self-employment to traditional employment. The next revolution, if the 34 percent of Americans who make up the contingent workforce can be considered a canary, may be just the opposite. Despite its connotations, the word “revolution” has no intrinsic positive or negative meaning. It refers simply to paradigmatic change, which itself creates winners and losers. In the prior Industrial Revolution, workers both won and lost. Economists Nicholas Crafts and Terence Mills calculated that the real wages of British workers more than doubled between 1840 and 1910. At the same time, unsafe conditions, child labor, and brutally long workweeks became a way of life for the working class. There is, however, more to this story. In both Britain and the United States, wages continued their upward trajectory throughout much of the twentieth century; child labor and inhumane working conditions did not. Had the Industrial Revolution never happened, the labor right movement never would have, either. Workers organized and fought for their rights, extending a golden age of capital to labor as well. As productivity grew — as corporations earned greater returns on their invested capital — so, too, did workers’ wages. In recent decades, however, productivity and wages have diverged. Although economists have proposed different explanations, the clear contributor is technological change. Once upon a time, the only way to increase productivity was to add a worker. No longer is this the case, producing downward pressure on wages. U.S. manufacturing output, for example, is greater than ever despite the sector employing 8 million fewer people than it did in the 1970s. Real wages in manufacturing, meanwhile, have steadily declined. Outside of manufacturing, these trends are even more stark. In the U.S. software industry, which is growing at triple the rate of the broader economy, productivity is even less hitched to jobs and wages. When Instagram sold to Facebook in 2012, for example, it was a billion-dollar company with just 13 employees. These trends point to a truth that workers and executives already realize: In the internet age, the traditional employment model is no longer the most efficient way of organizing either labor or capital. But can the gig economy produce a better distribution? Labor activists have been among the loudest opponents of the gig economy. They point to Uber and other high-profile employers of contingent workers, decrying a dismantling of 20th-century labor protections and benefits guaranteed to most full-time workers. The common thread of all these arguments is that they place upon the corporation roles other than merely organizing workers toward a shared goal. Opponents point out, for example, that employer-provided healthcare is essentially unheard of in the gig economy. They forget, however, that employer-paid healthcare isn’t inherent to full-time work, either. It’s actually something of a historical accident in which post-war employers began offering health insurance as a benefit in order to woo skilled workers. Forget these riders of full-time employment, and the gig model begins to look more appealing for workers. At its heart, the gig economy enables companies to buy only the skills they need and in the amount required. This benefits employers, of course, but think about what it means for workers. Because they’re selling only their most valuable skills, workers can command higher per-hour pay than in the traditional model. The result is a more efficient labor model in which workers are more responsible for the fruits of their labor and companies can pay more knowing they are buying only what they need. The study went on to argue, interestingly, that even as inequality increases in growing economies, the extraction ratio — essentially, the proportion of excess capital siphoned by plutocrats before being dispersed across the society — can fall. But in declining economies, greater inequality is almost always correlated with a greater extraction ratio. In other words, the authors argue, economic growth is the key to ensuring capital reaches everyday people. It’s too early to tell whether the gig economy will grow the economy in a long-term sense. But there is ample data showing that the economy is growing in the direction of gig work. In 2016, Harvard and Princeton economists found that 94 percent of net job growth since 2005 was in the “alternative work” sector — the gig economy. Essentially all the 10 million jobs created during that period were not typical 9-to-5 jobs. The unvarnished truth is that inequality continues to worsen across the U.S. while traditional job growth has been anemic at best. The gig economy, on the other hand, is flourishing; encouraging it may be our best chance to curtail inequality. Growing the gig economy might be the last thing labor activists want. But just as the Industrial Revolution was trailed by a revolution in worker’s benefits, so ought this one. American workers have been seduced by the idea of receiving healthcare and retirement benefits from employers on top of wages. Society is so set in this notion that it has overvalued employment. Workers are willing to give eight hours — in most cases, trading autonomy and fair pay — in exchange for benefits. The obvious and perhaps only solution is for the federal government to distribute healthcare and retirement benefits to all. Wouldn’t it be nice if one’s basic needs didn’t hinge on a 20-year-old education remaining attractive to employers desperately fighting to provide value in a changing world? With willing citizens behind it, the wealthiest government the world has ever known, the U.S. government, is uniquely capable of doing so. Beyond benefits, wages are the second piece of the puzzle. Although it’s true that the gig economy empowers workers in salary negotiation, broadly speaking, it is also true that only the most financially stable workers are in a position to negotiate. Women and minorities in particular are unlikely to negotiate, producing inequality. It isn’t an easy answer, but society must temporarily prop up these disadvantaged groups to ensure equal pay for equal work. This is one of many hurdles the gig economy will face, but it warrants further exploration by governments and policy researchers alike. Still, the gig economy offers a historic opportunity. If basics like healthcare and retirement were handled by the federal government, citizens could focus on continuing their education, honing their skills, and contributing to their communities. Scrapping an outdated management construct in favor of a more efficient model could help companies cut costs and improve output while restoring power to workers and growing the economy. Workers and executives alike can see that capital and labor are out of whack; what they can’t see — or can’t agree on, anyway — is what to do about it. 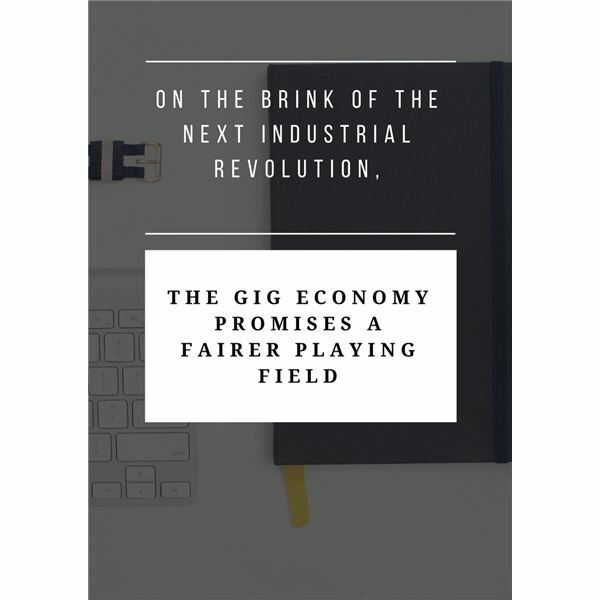 Gig work may not be a silver bullet, but the lesson of the Industrial Revolution is this: Redistribution of capital and labor is inevitable; equitable redistribution is not. The gig economy could be our chance to achieve that. Trevor Foster is the vice president of finance and innovation at Innovative Employee Solutions, a leading nationwide employer of record that specializes in payrolling and contractor management services for today’s contingent workforce. Trevor drives IES’ current and future financial success by collecting and analyzing financial and market data, determining internal strengths and capabilities, and maximizing the return of assets deployed by the company. Trevor has been with IES for more than 5 years in various capacities in the company’s finance department contributing to the strategic direction of its financial development. In 2015, Trevor joined the IES leadership team as vice president of finance, taking on increased responsibility for financial efficiency, effectiveness, and scalability across all company departments. Prior to joining IES, Trevor worked in finance for the technology and realty sectors, holding various accounting positions at Games Workshop and Crye-Leike Realtors.